Many times I have wanted to write about the atrocious way in which science is misreported by journalists, how this is complicit with capitalism, feeds an anti-science agenda, and confirms conservative biases. You wouldn't think that the astounding new images of the M87 black hole would be the place to start. And indeed it's far from the worst example. But maybe it's useful to consider for precisely that reason. Journalism is fixated on the story. It needs to turn a chaotic world of interactions into a simple, linear narrative that an eight-year-old can follow. But your life is not a story. It is not linear, with clear demarcations of good, evil, and so on. A moment's consideration will realise that no life is a clear progression from A to B, because even if this path is indeed one of the "journeys" (another word journalists love) you are "on", that's far from the only dynamic. A focus on the story must omit everything that doesn't fit. It must heighten drama, find (and then simplify) conflict, and so on. It must validate the heroic or brilliant individual that is the engine of change. Science reporting is a perfect example of this. Time and again the Great Man fallacy is advanced. Although, whenever possible, journalists will do all they can to find an attractive person for their headline article. This focus on individualism is complicit with two myths in the neoliberal world: democracy and capitalism. Because each has, at its heart, a focus on the individual who must be in conflict with everyone else around her, in a battle for supremacy in which "there can be only one". Only one athlete can be victorious. Only one party can win the will of the people. Only one movie is "the best". It doesn't matter who you step on to get to the top. Resources are there to be consumed. Etc. This myth denies social structures, cohesion, collaboration, and sharing. It undermines everything that is good about people, every ethos except the self-serving need to beat out the competition. Hannah Devlin is Science correspondent for The Guardian. 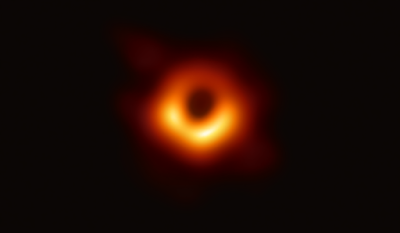 I'd like to highlight her article “Black hole picture captured for first time in space breakthrough,” because it's a good example of what science journalism can be. But it also highlights the biases I've only briefly sketched. In this case the lead is the image itself, as it so often is with astronomy. We have had plenty of confirming data about black holes over many decades, but until one is imaged (transduced into visual light frequencies) it's not really compelling to many readers. That is understandable. Ocularcentrism is alive and well. (A matter for another post.) This is why astronomical agencies spend so much time and money on producing still and moving images. Early on we find out that “The breakthrough image was captured by the Event Horizon telescope (EHT), a network of eight radio telescopes spanning locations from Antarctica to Spain and Chile, in an effort involving more than 200 scientists.” This confirms that the venture was collaborative, spanning borders, and is not a matter of nationalism or any other petty self-interest. In the fifth and sixth paragraphs we get quotations from individuals, but it's clear they are spokespeople. The article focuses on the facts and is easy to understand for a general audience. So far, so good. Further down the page we get the story. Here's an individual to focus on. Katie Bouman, as a student, developed a crucial algorithm. With no outside data, it's hard to know how important her contribution was. The NASA press release makes no mention of her by name. Neither does the home page of the Event Horizon Telescope. Scientists operate with a very different ideology. Everyone on a science team makes a “crucial” contribution. Bouman's own statement confirms this: “We’re a melting pot of astronomers, physicists, mathematicians and engineers, and that’s what it took to achieve something once thought impossible.” This is not just being modest. It's a statement of a truth that, as a scientist, she would know well. Two facts confirm the narrative bias at work in the article. The information comes with a picture of a young, smiling, attractive woman. And her appellation is the diminutive “Katie”, though in her scientific work she is Katherine L. Bouman. I'll let you determine how sexist this is. So, bound up in one article we get an excellent “explainer” for the general public and an example of the fallacies at work in science journalism. P.S. Here is the series of science articles announcing the research results. By contrast, this BBC article hypes the individual while burying the team aspect below the fold. It even manages to include a fallacious image from the NASA team that makes the rounds on social media.